Elastic band on one side to hold tablet or laptop up to 10", other side has a mesh compartment for headphones, writing utensils and other college study essentials! You're going to need to take your dorm tablet or laptop to your college classes. You'll not only need to, you'll also want to but you won't want to carry them loose in your arms along with your other college supplies. It will be too easy to drop those expensive dorm electronics when you have so many other dorm essentials in your arms. Don't damage those dorm necessities in your first week of college when you're simply walking to class. Protect your expensive dorm electronics with our Tablet and Laptop Storage Case with Handles that holds laptops and tablets that are up to 10" long. Our Tablet and Laptop Storage Case with Handles is one of those cheap dorm supplies that make a huge difference in your dorm essentials. It has a zippered enclosure to keep everything you put in this dorm essential from falling out and it also has a hard shell to protect your tablet or laptop. One side of this must have dorm item has an elastic band to securely hold your tablet or dorm laptop while the other side has a mesh compartment for holding headphones, a calculator, writing utensils, and other college supplies you need for your college courses. 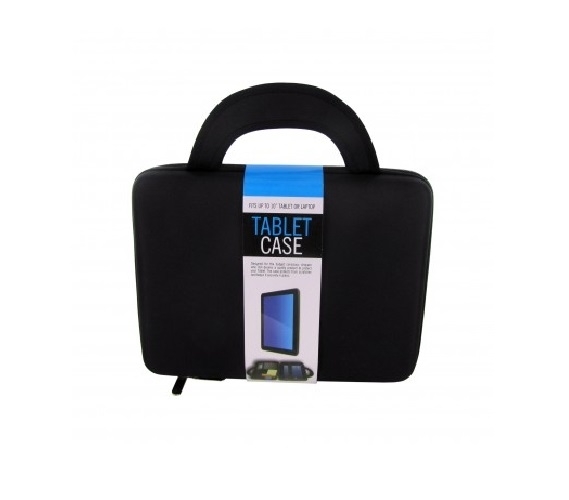 Keep your dorm tablet and laptop safe from damage in our Tablet and Laptop Storage Case with Handles! Plus with the mesh compartment in this handy dorm room supply, you won't have to worry about losing your pens and highlighters on the way to class as well. With simple dorm storage cases like this Tablet and Laptop Storage Case, you will be stress free while walking to class because you won't have to worry about losing your college supplies and damaging your valuable dorm items!